Guest Presenters were Mal and Michelle Cameron who spoke on Hybridizing Vrieseas. 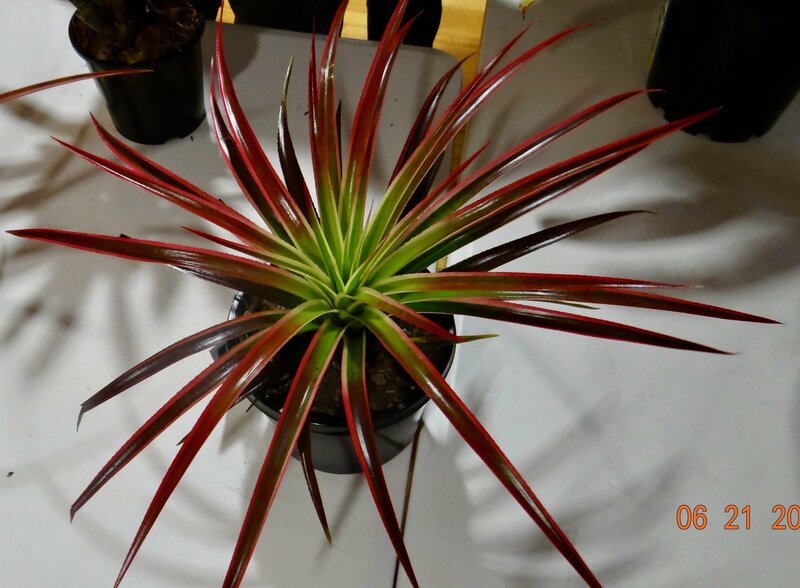 This covered our Plant of the Month segment - Vrieseas. 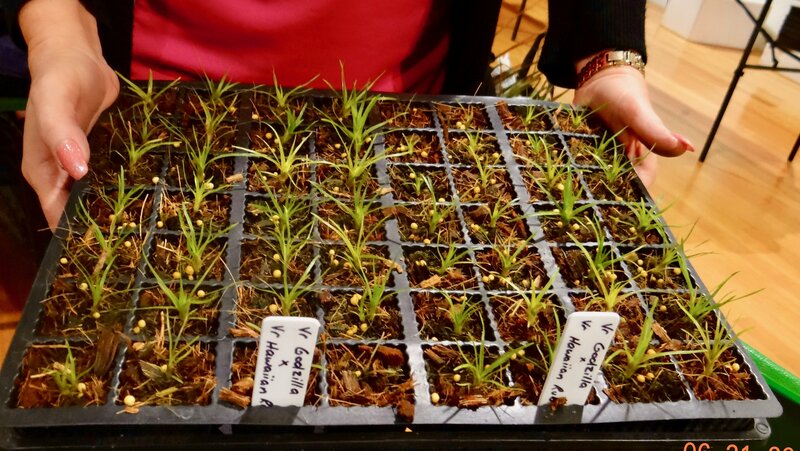 Mal took us through the process of selecting Vrieseas with desirable traits, cross pollinating between 10pm and 4am, careful labelling, collecting seed, and planting seeds for germination, and growing in increasingly larger pots. What mix does he use? Mal now uses coconut husk, choosing the coarser of three grades available. This retains water, keeping the mix moist. He gets it in bulk from Garden City Plastics, Underwood. Mal microwaves the mix to sterilize it. 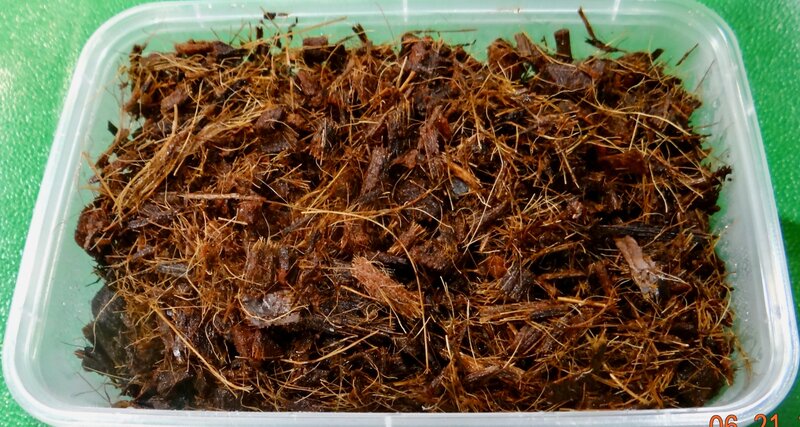 He no longer uses ground Coir-Peat which comes in blocks. He found it too dense, too moist, encouraged algae. 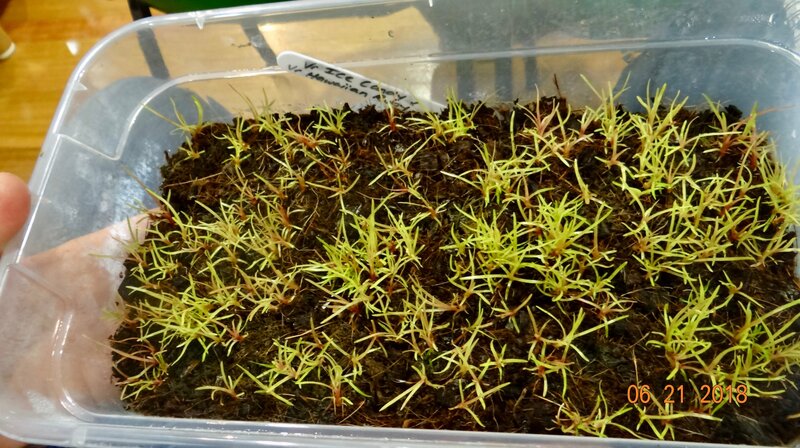 He doesn’t fertilise unless there is a need to accelerate growth of seedlings (which is not usual). He has no time to foliar feed! he’s trying to incorporate a pendular flower, as in Vr pardolina. he may find it in 1:1000 seedlings. He preserves that one, dumps the other 999. Crosses from Vr hieroglyphica seem most promising here. Mal showed us seedlings at different stages of growth. These need moving on every 10 months or so. He uses black shade cloth to protect seedlings from the mid-summer sun, but this can slow growth in winter! Other options include less dense shade cloth for winter, and adding another layer when summer comes. 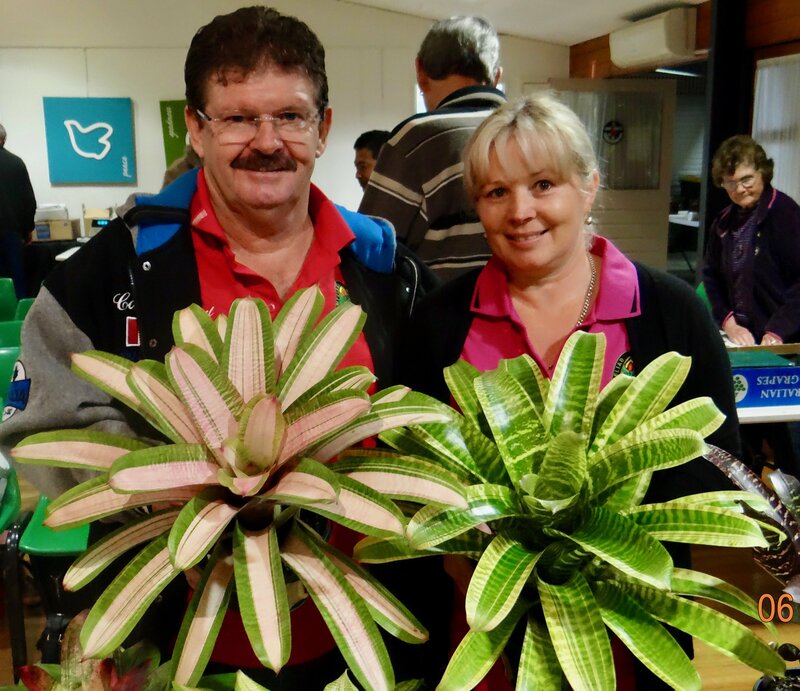 Guest Presenters Mal and Michelle Cameron with two of their amazing creations. 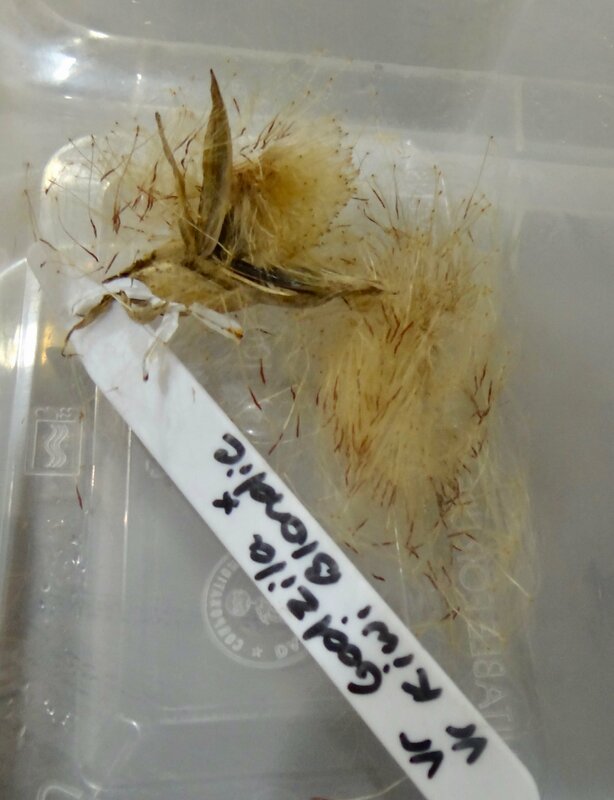 Seeds from a new Vriesea hybrid. Mal's preferred coarse coconut husk mix. Young seedlings a few months old. Variegated plants grow more slowly, and this is because the have less chlorophyll (absent in the variegation) to produce new tissue. Hawaiian Vrieseas take longer to flower than in Qld, taking 4-5 years. 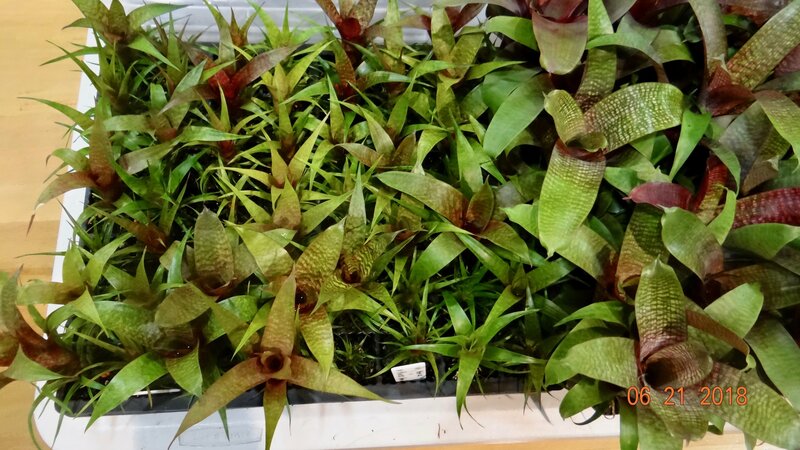 Mal imported 600 vrieseas from Hawaii, and they take up to 6 years to flower. This delay makes for larger plants. 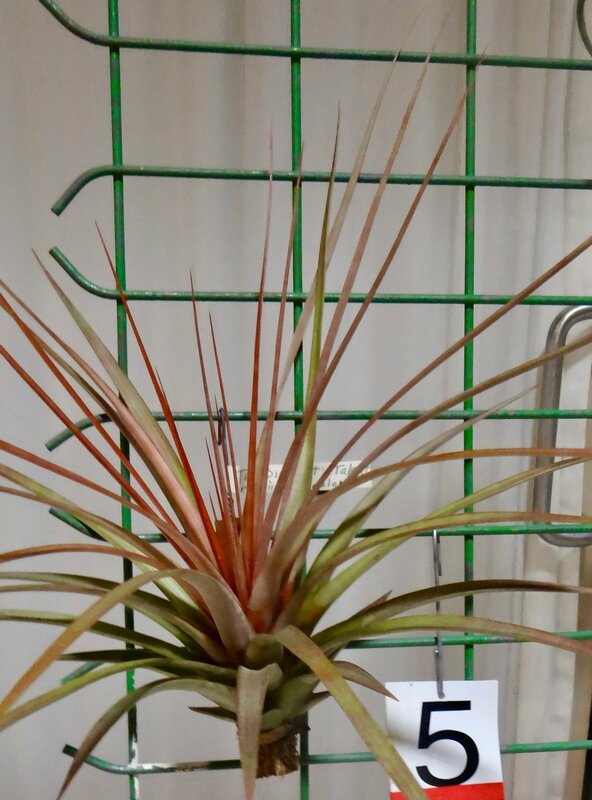 A fine example was Vriesea ‘Pink Dream’ that got first place in the competition tonight. 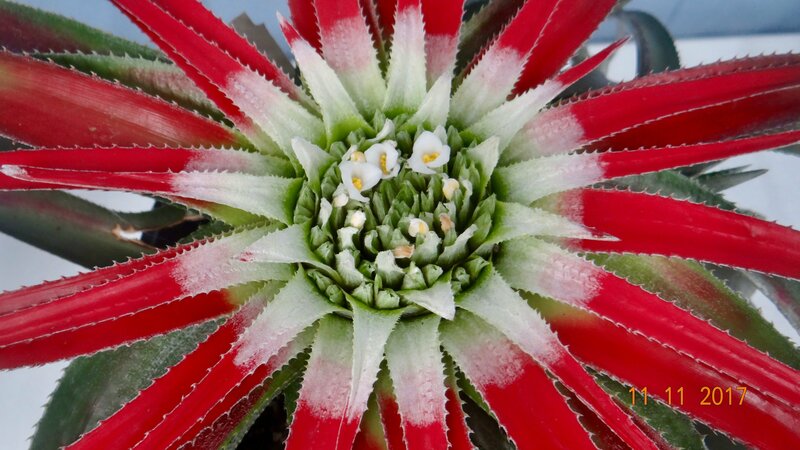 The plant must flower before registration, this delays registration of the new hybrid which can take 6 to 8 years. 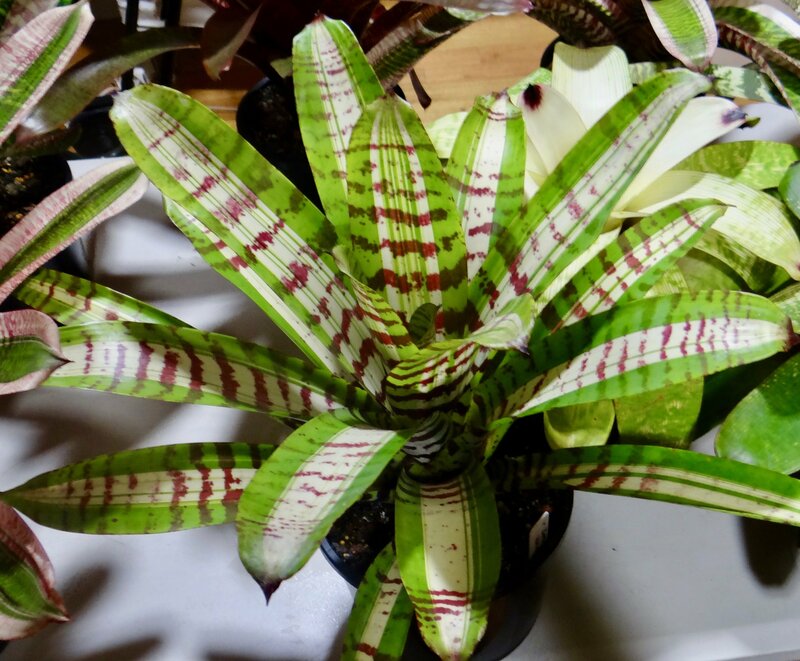 Plants with variegation on only one side curl because the green side grows more quickly than the other. Vriesea ‘King David Kalakaua’ never flowers in SEQ, might be due length of daylight. To promote growth of offsets, Mal removes the inflorescence early, so that growth is directed into offsets and not the inflorescence. Mal generously presented a gift to Bruce Dunstan in recognition of Bruce’s work in hybridizing, especially Alcantareas. The gift was Alcantarea ‘Bruce Duncan’ which is a mutation raised from seed and registered by Mal on the BCR. 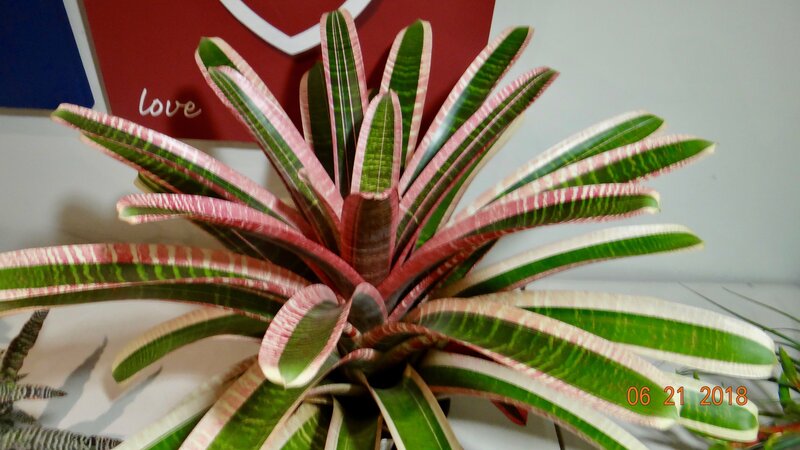 Vriesea 'Pink Dream' won first place in our Popular Vote Competition. This plant is about 5 years old. Registered 2003 by David Fell of Hawaii. a glaziouana with bold central variegation. 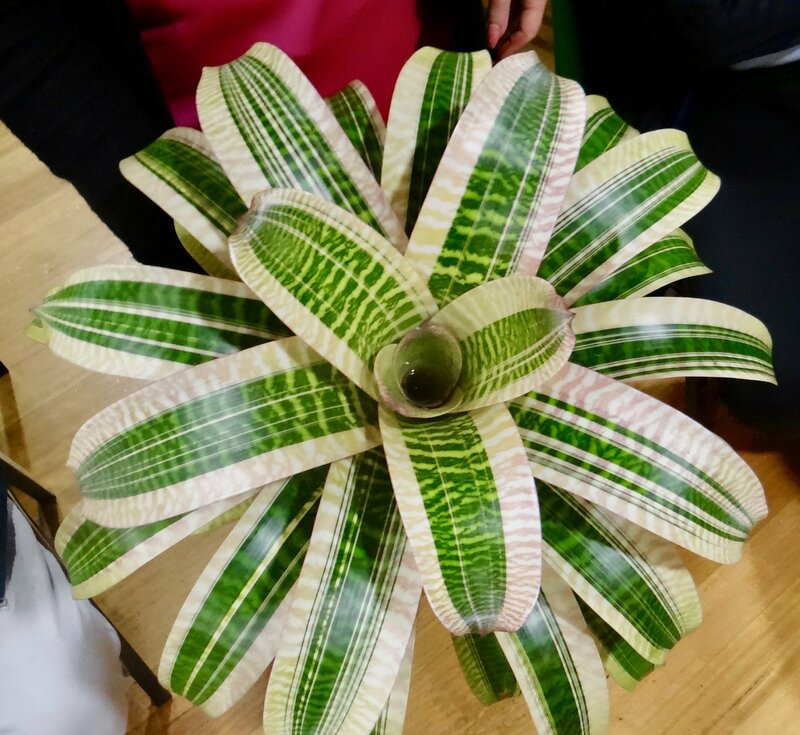 A Vriesea from David Shiigi of Hawaii. This has beautiful dark colour, and lacks variegation. Mal seeks to harness these features for future hybrids. 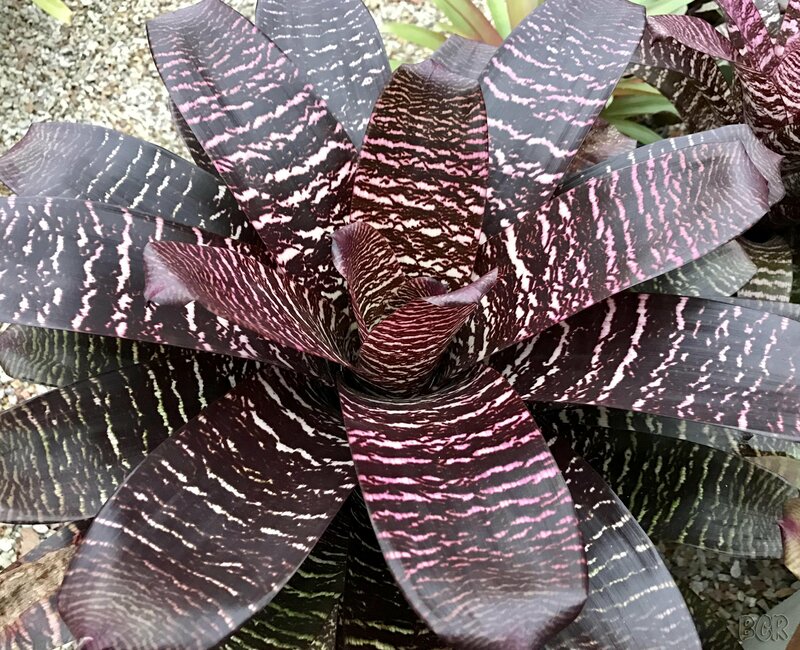 Vriesea 'Black Pearl'. This is a cross between 'Black Beauty' x 'Patrice', registered 2017.
xVriesgoudaea 'Supernatural' is a Chester Skotak bigeneric with Vr 'Barbara' x Goudaea ospinae var gruberi. 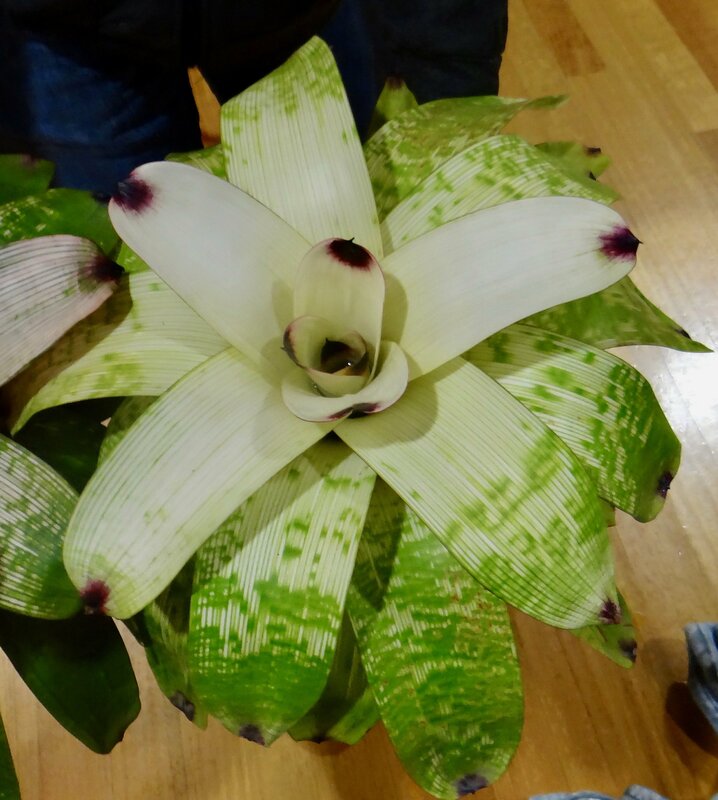 This interesting plant was raffled. 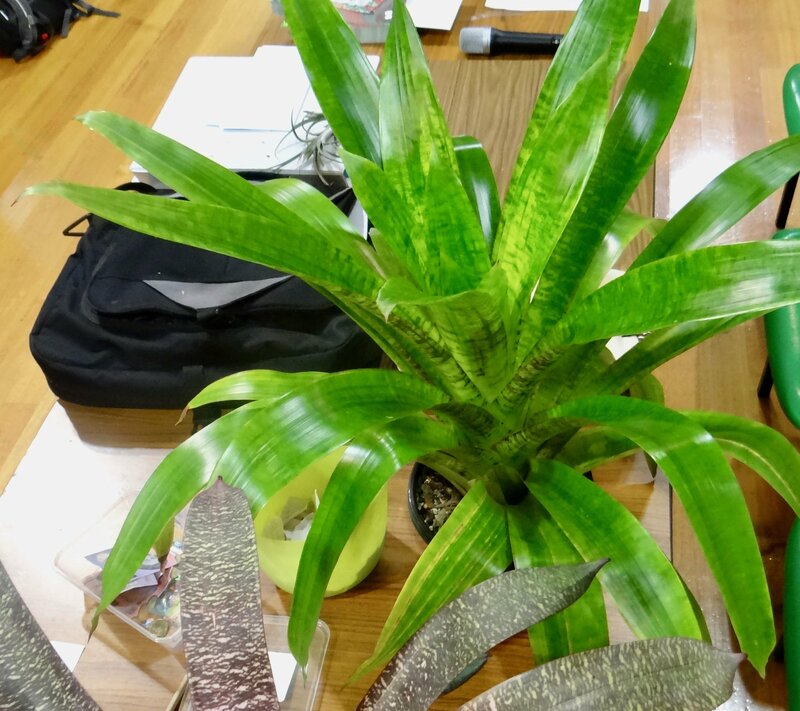 In the Information Session, John Olsen demonstrated the separation of offsets from mature plants. John brought in several clumps of plants to illustrate. A clump of three Till ionantha was held together tightly by roots, and separation required careful teasing the plants apart. Offsets could easily be removed from a clump of xSincoregelia ‘Ralph Davis’, using a knife, and a ‘cut and twist action’. 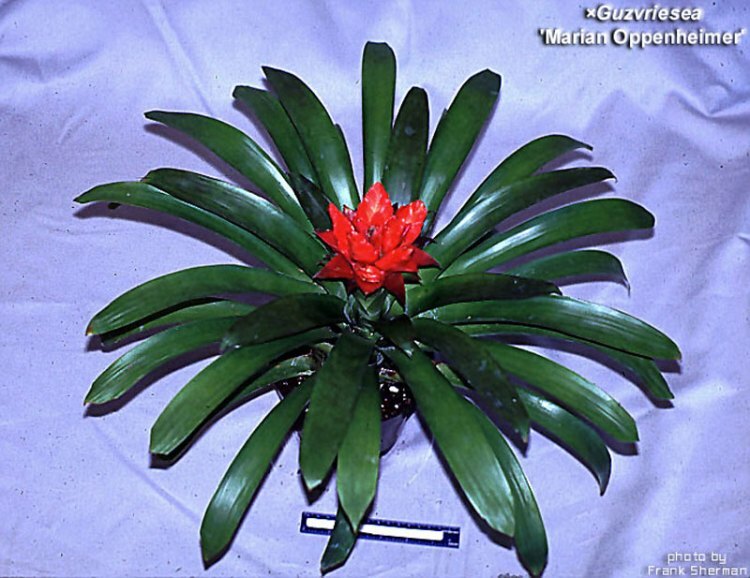 Vrieseas often grow offsets not at the base, but higher up the plant stem, and are referred to as ‘upper puppers’ eg., Vr hieroglyphica, Guzmania sanguinea, etc. Taking pups often means pulling apart the plant altogether, and destroying the mother. After removal of offsets, a raw or bare area of the mother needs attention, either by delay in potting for several days, or treating the raw area with a fungicide like tomato dust. Thanks John for the practical class. friday 10th to 19th, August. We need volunteers to host our display, greet people, answer questions about our Society. 9 to 1pm, and 1pm to 5pm. Entry is $15 per person, with no limit on entries, and free entry to the EKKA. 1st. xSincoregelia ‘Galactic Warrior’ by Alfonso Trudu. 2nd. 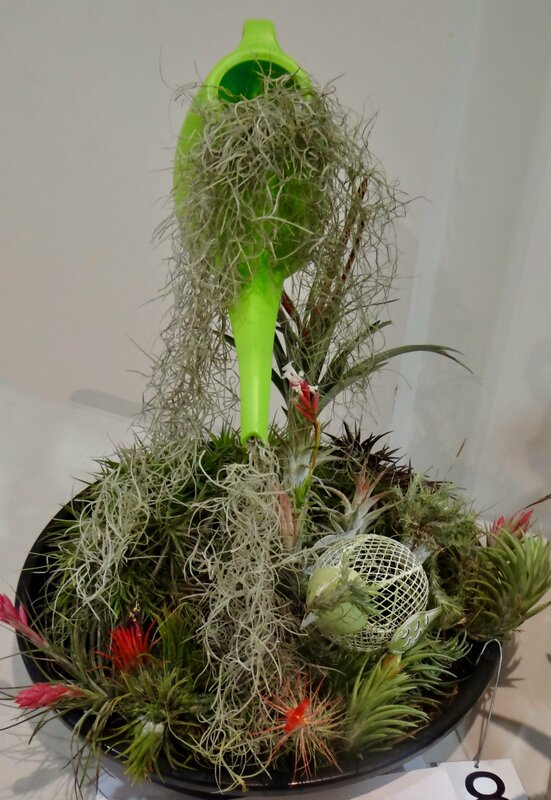 Tillandsia subteres by Gilda Trudu. Equal 2nd. 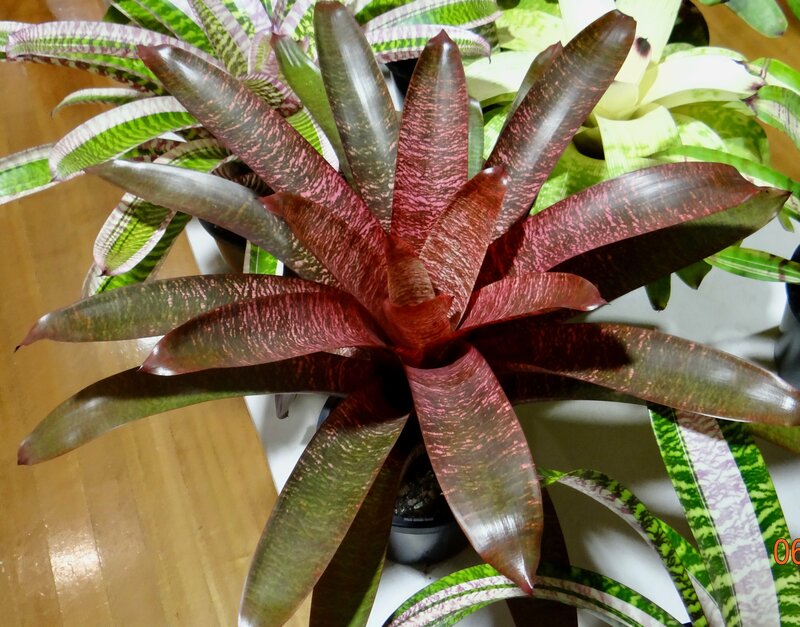 Neoregelia ‘Hot Flash’ by Judy Whitehorne. 1st. 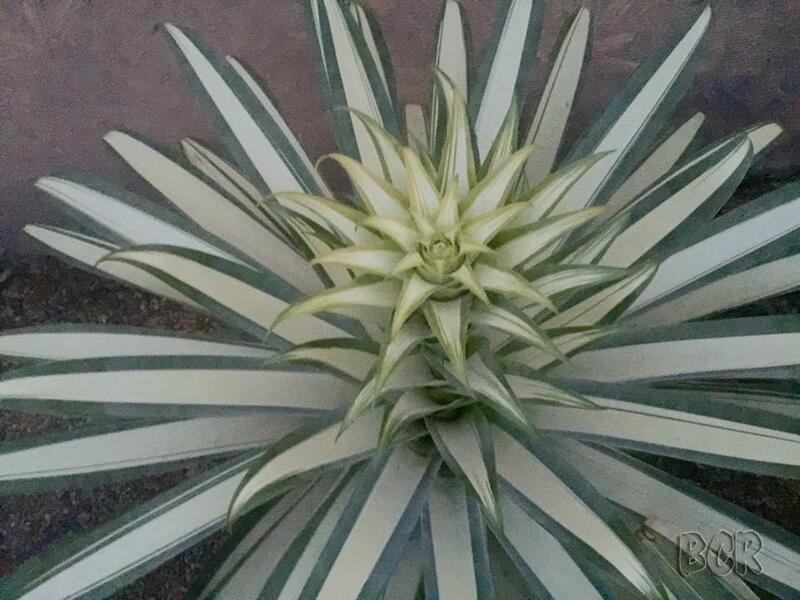 Aechmea ‘Aztec Gold’ by Fred Thomson. 2nd. Guzmania sanguinea tricolor by Maxim Wilson. 3rd. 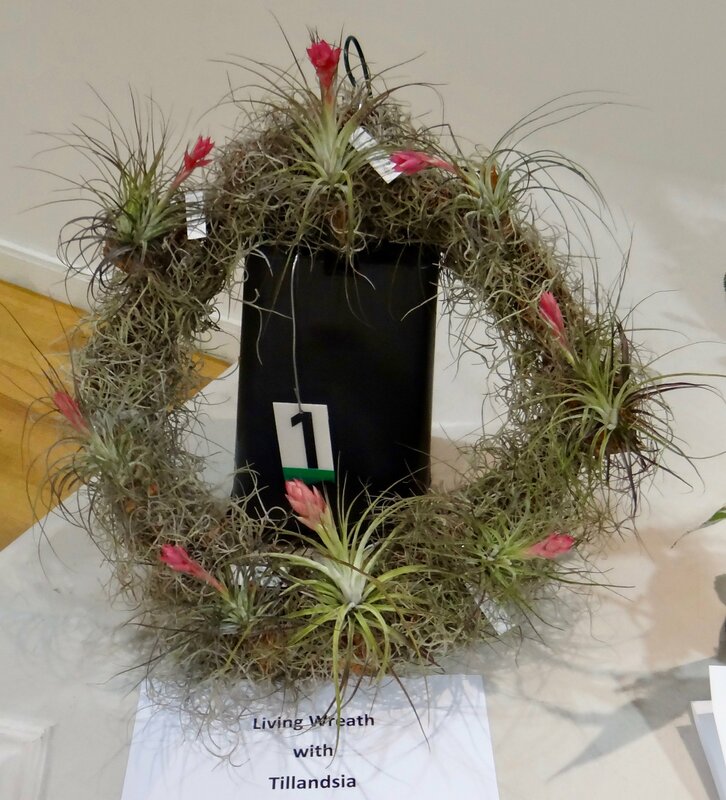 Tillandsia ‘Dimmitt’s Talent’ by Fred Thomson. 1st. 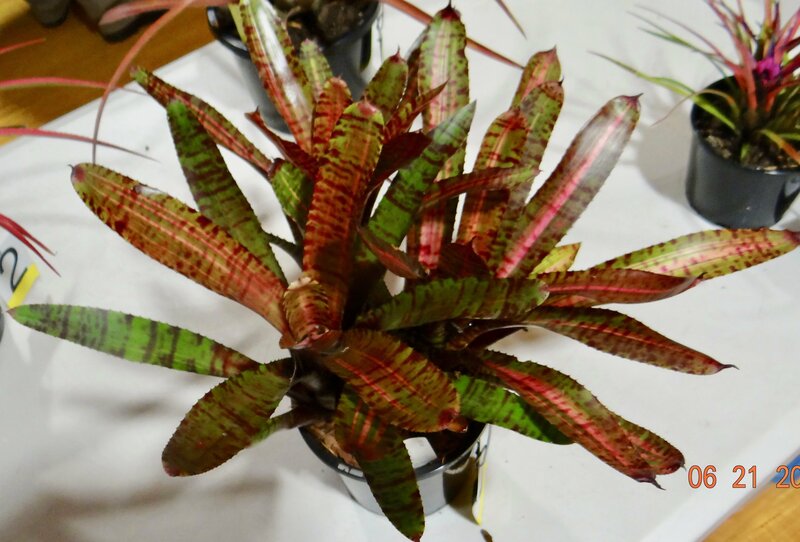 Vriesea ‘Pink Dream’ by Mal Cameron. 2nd. Till. 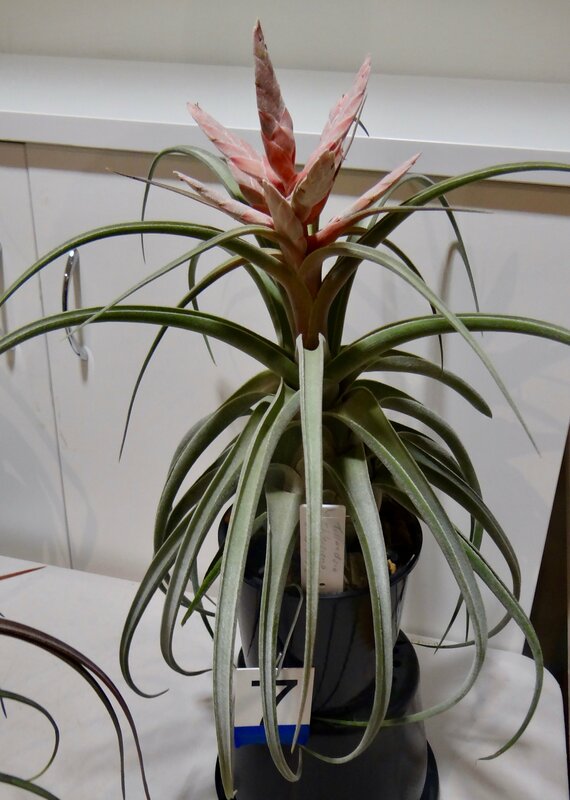 ehlersiana x streptophylla by Ron Jell. 3rd. Tillandsia ‘Ty’ by Bruce Dunstan. 1st. ‘Water Air Plants’ by Ron Jell. 2nd. ‘Living Wreath’ by Gilda Trudu. 3rd. ‘Framed Tillandsia’ by Alfonso Trudu. xSincoregelia 'Galactic Warrior'from Alfonso Trudu. 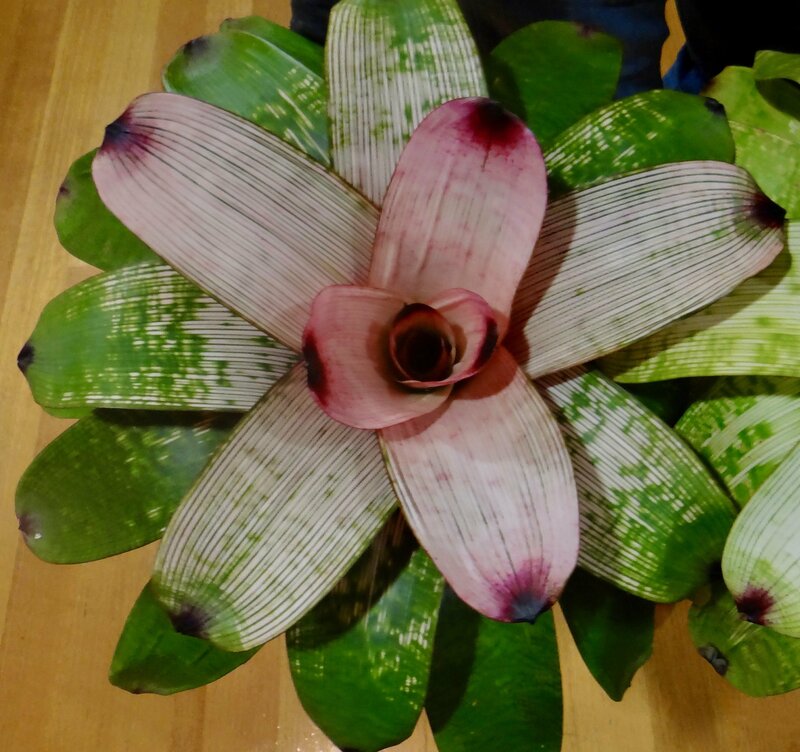 Neoregelia 'Hot Flash' by Judy Whitehorne. 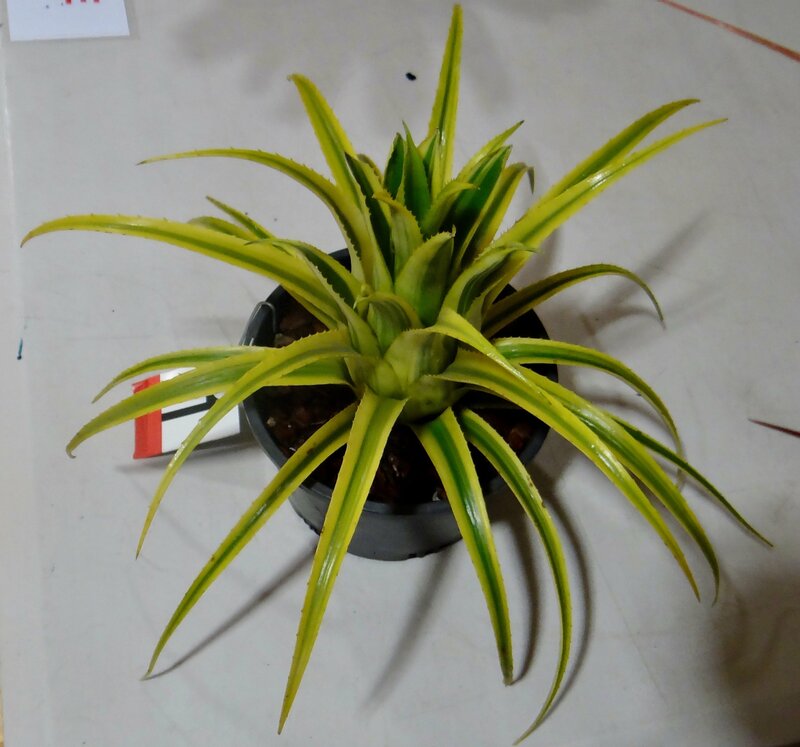 Aechmea 'Aztec Gold' from Fred Thomson. QandA on Fertilising with Bruce Dunstan. Plant of the Month Spring Flowering Tillandsias with Bruce Dunstan.